One of my favorite things to eat in Taiwan is beef noodle soup (牛肉麵). The beef noodle soup on Yong-Kang St. is famous and rightfully so. Yong-Kang Beef Noodle is a two story building and often busy during prime meal time. Every bowl comes in small or large, I opt for the small which is more than plenty for me. 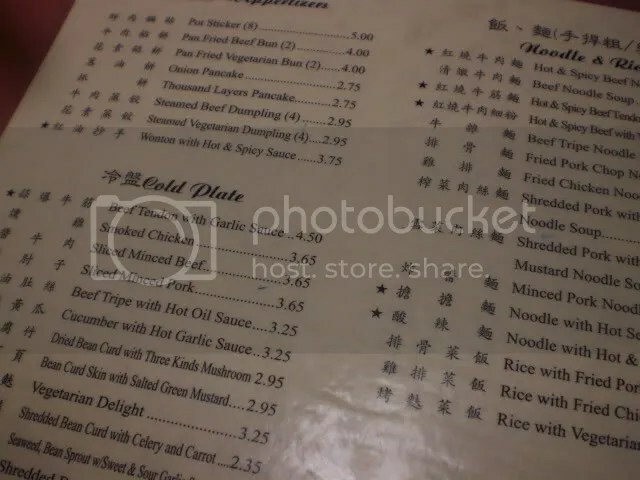 My favorite is the braised beef noodle soup (紅燒牛肉麵, 160NT for a small bowl). 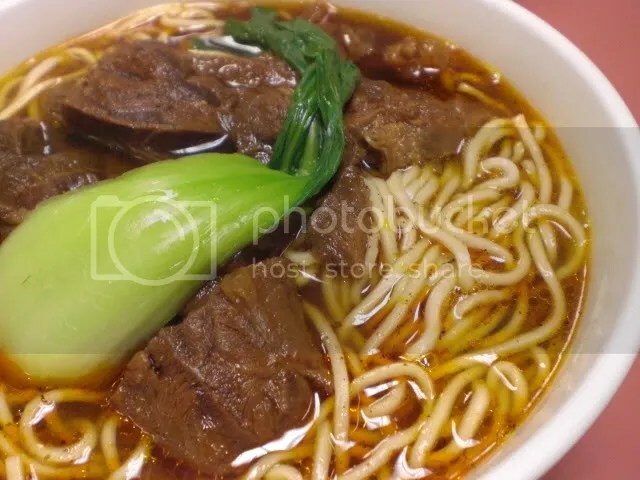 braised beef noodle soup (160NT). One of the best things about the beef noodle soup here is that the beef is always tender; I hate when the beef is chewy and dry. I am all about the broth when it comes to noodle soups. If the broth isn’t good, I don’t want it. Here at Yong-Kang Beef Noodle the broth is one of my favorite parts. Yes it’s salty, it’s supposed to be it’s soy sauce flavored, but it’s good. The flavor is great, rich, but in a good way. It is, however, not very spicy for those used to braised beef noodle soup being spicy. The noodles are good too: not too chewy, not soggy, thin though, not thick like many places are. Overall, this is a good bowl of noodle soup worth your 160NT. The side dish selection here is amazing. Unlike other stores where the side dishes are already pre-dished out, you have to go up to the front and tell them what you want. From there they’ll scoop out a portion for you and send it to your table or just hand it to you there. My favorite is the eggplant. It’s perfectly seasoned and never tastes old. I’ve also had the cucumbers here which are good as well. They are a little more on the sweeter side if you’re expecting pickled and salty. However, they’re really crunchy, which is good, and not overly sweet, just sweet enough to possibly throw you if it’s not what you’re expecting. Overall, the beef noodle soup here is famous for a reason. It’s pretty averaged priced for beef noodle soup, but not average tasting. The large bowls don’t look that much larger than the small bowls, but then again looks could be deceiving. Taiwanese food is one of those things that I crave all the time. Maybe it’s the Taiwanese in me or maybe it’s because I miss Taiwan so much or maybe it’s just because I love Taiwan. Whatever it maybe, Taiwanese food is delicious and unfortunately difficult to find in the US. One of my favorite places to go to satisfy my craving is A&J’s in Cupertino. A&J’s is a Taiwanese restaurant with actual branches in Taiwan. Food is ordered on a checklist that each table is provided with when they sit down. Be warned, this checklist is completely in Chinese. For those who don’t read Chinese they’ll provide you with a Chinese/English menu as well, but you have to order on the checklist. 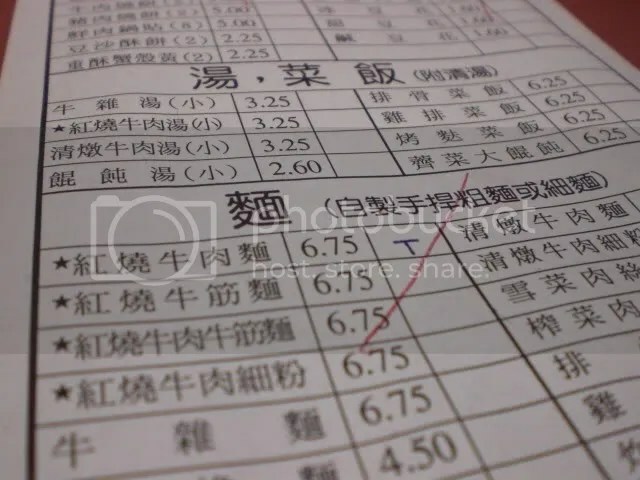 Many a time have I seen poor non-Chinese people trying to match the characters they see on the English menu to the Chinese characters on the checklist. The A&J’s in Cupertino seems to have more English speaking workers, but in Irvine I feel like the mix and match Chinese character game is more likely. I always start out with some 小菜 (small dishes, kind of like snacks or appetizers). 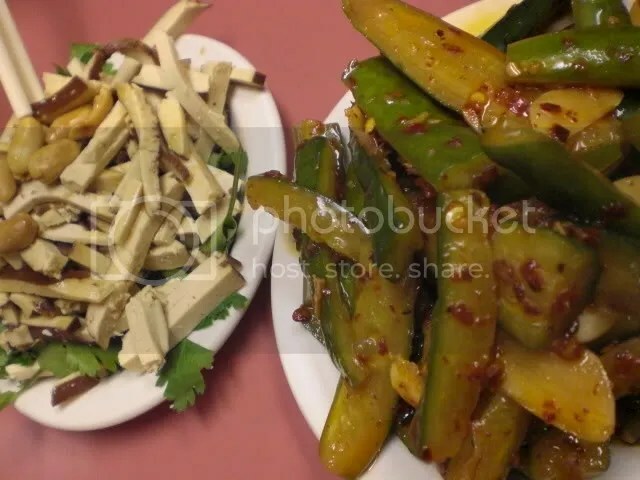 First thing I usually order is 麻辣黃瓜 (cucumbers in hot garlic sauce, $3.25). I love it. It’s crunchy, a little sweet, spicy, and refreshing. I like to save some and eat it with my main dinner, to give it a little extra crunch. Dan always likes the 皮蛋豆腐 (thousand year old egg with tofu, $3.65), but they were out that night so we got 香菜豆干 (dried bean curd with cilantro and peanuts, $2.25). We had never gotten it before, but it was pretty tasty. Cilantro with dried bean curd is really good for some reason; they compliment each other. For my main dinner, my favorite thing to get by far is the 紅燒牛肉麵 (hot and spicy beef noodle soup, $6.75). I’m not sure why they call it “hot and spicy” because it really isn’t, but that’s what they have it as on the English menu. I always get it with 細麵 (thin noodles), but you can get it with 厚麵 (thick noodles). I just prefer noodles that aren’t so chewy. Beef noodle soup is a popular Taiwanese dish. In Taipei there is a store that has the best 紅燒牛肉麵 ever. It’s hard to come by places that have really good broth, to me at least. A&J is by no means the best beef noodle soup I’ve ever had, but it’s my favorite beef noodle soup I can get in the US. The broth is rich, but not too salty or oily which I’ve found many places to be. The beef tendon is usually pretty good too. I’m getting hungry just talking about it. 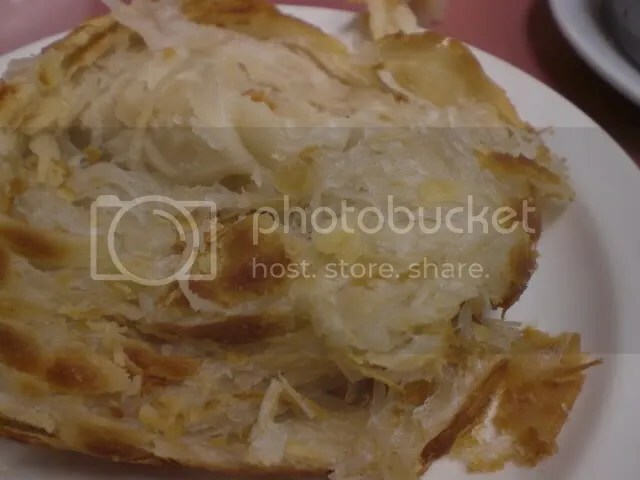 We also always order either 蔥油餅 (onion pancake, $2.75) or 抓餅 (thousand layer pancake, $2.75). This time we decided to order the 抓餅 (thousand layer pancake). It was great. Perfectly flaky, not too oily, and fresh, just the way it should be. It’s great when you order the beef noodle soup too cause you can dip the pancake into your soup. Sometimes we’ll order something else at random just cause we’re hungry. Dan was hungry so he decided to order some 小龍包 (steamed soup dumplings, $2.95). 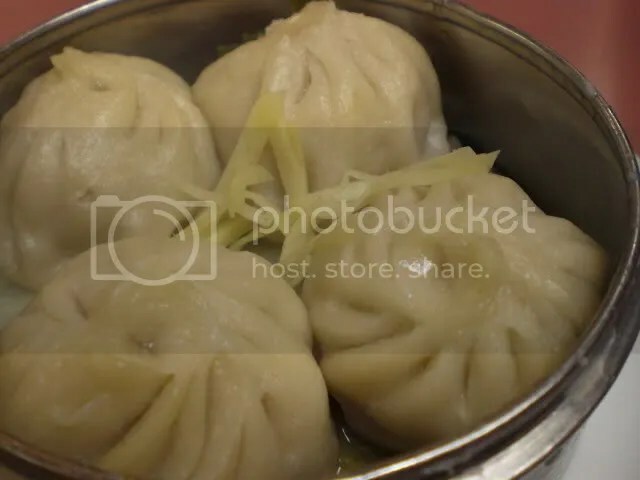 One order comes with four dumplings. They’re filled with a pork filling and aren’t bad, but they aren’t great. You could get better somewhere else. Overall you can easily eat a meal for two here for about $20. Service isn’t amazing, but I mean, the more authentic the worse the service. It’s not that they completely neglect you, but if you don’t speak any Chinese good luck trying to get someone’s attention. Oh, and don’t forget cash, the don’t take cards. For Taiwanese food, I’d recommend it. In fact, it’s one of my favorite places to eat. When I asked Dan what he wanted to eat for his 24th birthday he said sushi sounded good, so off I went to find the best sushi in San Francisco. Yelpers had rated Tataki the number 2 sushi bar in San Francisco, so I was hoping that yelpers wouldn’t let me down. They didn’t. As I began driving toward the Marina District of San Francisco Dan recognized where we were. I spotted Tataki and proceeded to look for parking that was rather impossible to find. Luckily since it was a Thursday night it only took us maybe 5 or 6 circles around the block before we found parking about a block and half away. Much closer than either of expected to find. Once we entered, the first thing we noticed was how small it was. The sushi bar sits 4 and there were probably about 10 tables total. We arrived around 7:30pm and were sat right away. To be honest, I found the decor to be rather pretentious, but I guess we were close to the Marina in San Francisco, so what else did I expect. 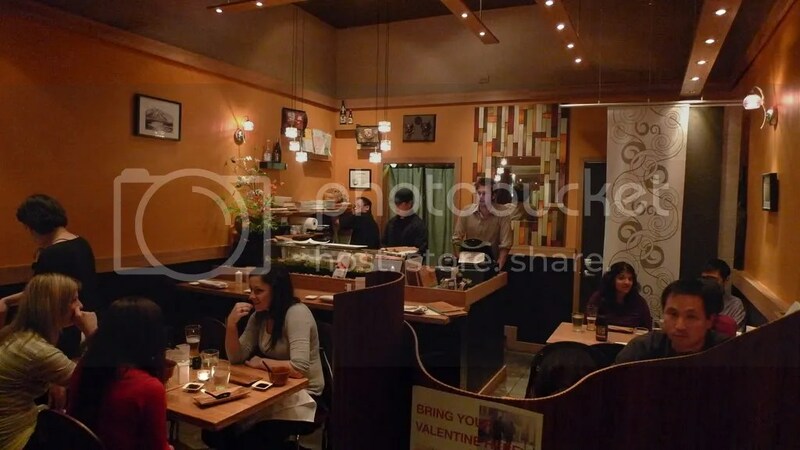 The reviews all mentioned that Tataki is also the first fully sustainable sushi bar in San Francisco. I thought that was kind of cool, but really, whatever. The menu here is pretty small, which is good for those who don’t do well with too many choices. Although there weren’t that many choices listed on the menu, I still felt like I had a lot to choose from because everything sounded delicious. After reading some reviews on yelp I thought the Tataki Deluxe would be a good choice and Dan thought it sounded good too. Since it was Dan’s birthday I told him to pick the rest. He ended up choosing the Extinguisher roll and the Golden State roll. We also decided to get a bottle of Nigori. First thing that came out was the Tataki Deluxe ($30). There are no words to describe how amazing this was. It was described on the menu as an assortment of 20 pieces of seared fish with dipping sauces, which sounded amazing and it was. It came in a large round wooden platter: 4 slices of 5 types of fish with 5 sauces, one for each fish. The Deluxe came with Kanpachi served with jalapeno ponzu sauce, Arctic Char served with yuzu citrus sauce, Albacore served with garlic sauce, Skipjack Tuna served with garlic sauce, and Yellowfin Tuna served with tataki sauce. Every piece of fish was fresh, tender, and melted in our mouths. Dan’s favorite was the Kanpachi which was also served with a slice of avocado and a grilled jalapeno slice. My favorite was probably the Skipjack Tuna that had garlic crumbs sprinkled on top or the Yellowfin Tuna. For $30 you get a taste of everything and it’s so worth it. Tataki Deluxe ($30): Clockwise starting at the top left: Skipjack Tuna, Albacore, Yellowfin Tuna, Arctic Char, and Kanpachi. Next came out the Golden State roll($15). Our expectations were high considering how much we loved the Tataki Deluxe and the Golden State did not disappoint. 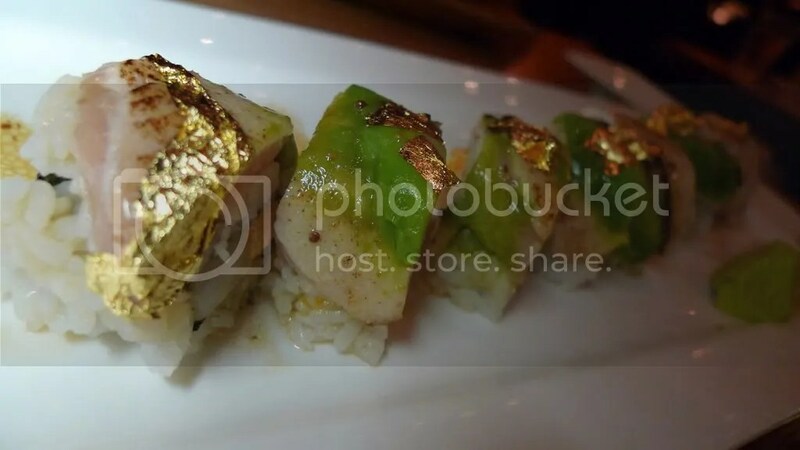 Spicy scallops with diced apple topped with albacore, avocado and 24k gold flakes, the Golden State roll was tasty! I love scallops and the apple with the scallops worked surprisingly. I was skeptical when I read the description, but the apply added a nice texture to the roll along with a subtle sweetness. Since scallops are already sweet, the flavor the apple complimented it. 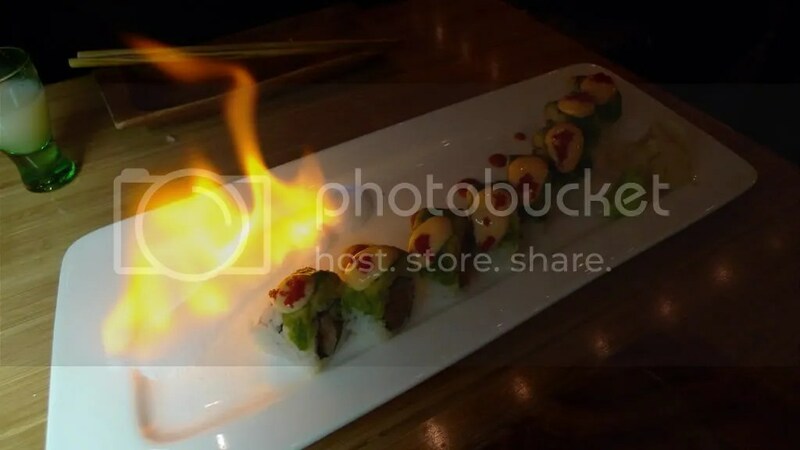 Last came out the Extinguisher roll ($13). A good majority of the yelp reviews had mentioned this roll and it sounded good to us. Spicy amberjack topped with avocado, habanero masago, and hot sauce sounded good to us. It came out on fire, literally. That we were not expecting, but was pretty cool. They had a little mountain of salt lit on fire beside the roll when it came out, so props for presentation. The roll itself was great. I thought it was just the right spiciness. Spicy enough to feel the heat, but not too spicy to kill your palette. I’d definitely get it again. Overall for $85 after a 20% tip we were extremely satisfied. The Deluxe, two rolls, and bottle of Nigori($10) was just about the perfect amount to share between the two of us. Other than the pretentious decor, there isn’t anything I don’t like about Tataki. 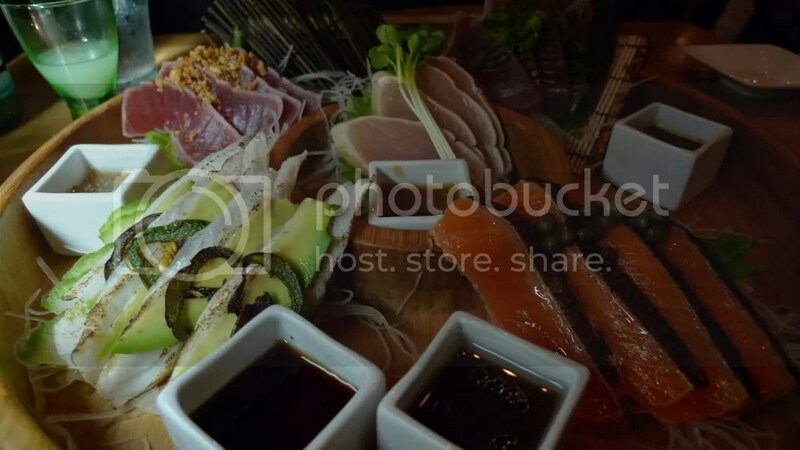 We absolutely will be making several trips back to Tataki. You should try it too. I dare you.